Earnings from employment, including income from assistantships, are usually subject to federal, state and local income taxes. I am here on an F or J visa. 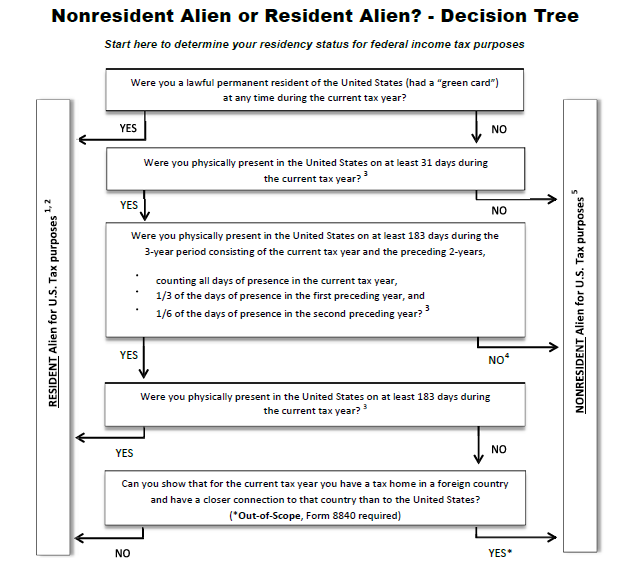 Am I a nonresident alien? 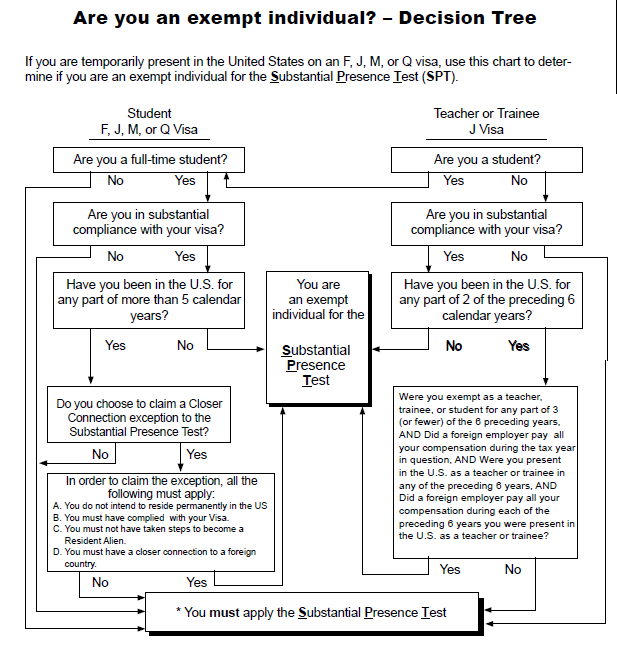 All individuals who are exempt from the Substantial Presence Test need to file form 8843. You do not need a SSN/ITIN to file this form. The form has information about your visa status, where you are going to school / doing research or teaching, and when you have been in the U.S.
You receive any U.S. income that is taxable. Taxable income can include, but is not limited to: wages from a job, scholarships that cover room and board, interest, dividends, gains from stock sales, and earnings as an independent contractor. You receive a scholarship that is partially or totally tax free. To claim a tax treaty. Is there a Lehigh regular VITA site we could refer people to? China students continue to get treaty benefits even after they become residents. Do they handle this? I am a nonresident alien -- how do I file a federal income tax return? Pick up your 1042-S income statement from OISS before March 1st. Not all students / scholars will receive one of these documents, and OISS can confirm if you will or will not get one. If you do not pick it up before March 1st, it will be mailed to you. Additional information on federal income tax obligations may be found in Internal Revenue Service (IRS) Publication 515, Withholding on Nonresident Aliens and Foreign Corporations, and 519, U.S. Tax Guide for Aliens. You must file Form 1040NR-EZ (or Form 1040NR) if you were a nonresident alien and received income in the United States during 2018. You must file even if your income is exempt from U.S. tax under a tax treaty or any section of the Internal Revenue Code. You do not need to file Form 1040NR-EZ (or Form 1040NR) if you were a nonresident alien student, teacher, or trainee who was temporarily present in the United States under an “F,” “J,” “M,” or “Q” visa, and you have no U.S. source income (such as wages, salaries, tips, etc., or scholarship or fellowship grants). Individuals who are temporarily in the U.S. under an “F,” “J,” “M,” or “Q” will be exempt from the Substantial Presence Test – students for their first 5 calendar years, others for the first 2 calendar years (provided they were not previously exempt in the prior 6 years). Individuals who are exempt from the Substantial Presence Test need to file form 8843. If you file an income tax return, you file form 8843 with that return. If you do not need to file an income tax return, you will send only that form. You do not need a SSN/ITIN to file this form. The form has information about your visa status, where you are going to school / doing research or teaching, and when you have been in the U.S. If you are required to file an income tax return, you must file with IRS no later than the 15th day of the fourth month after your tax year ends. For example, for the 2018 calendar year, the tax return must be filed by April 15, 2019. If you have been in the U.S. as an F-1 or J-1 student for more than five years (counting the first year you arrived), you are a Resident Alien for tax purposes. If you have been in the U.S. as a J-1 scholar for more than two of the past six years (counting the first year of arrival), you are a Resident Alien for tax purposes. Use the address shown in the instructions for the form (1040EZ, 1040A, or 1040) you are using. If you are required to file a tax return but fail to file by the due date, you may have to pay a failure-to-file penalty. The penalty is usually 5% for each month or part of a month that a return is late, but not more than 25%. If you are more than 60 days late, the minimum penalty is the smaller of $205 or 100% of the unpaid tax. You may be subject to criminal prosecution (brought to trial) for actions such as 1) tax evasion; 2) willful failure to file a return, supply information or pay any tax due; 3) fraud and false statements; or 4) preparing and filing a fraudulent return. There might also be immigration consequences for failing to file taxes. Applicants for permanent residency or green card are often asked to show proof of tax filing for previous years in the US. For more information on penalties for failure to file returns or pay taxes as required, please refer to Page 37 of IRS Publication 519, U.S. Tax Guide for Aliens. If you had taxable income for Pennsylvania (Box 15 on Form W-2 is PA and Box 16 is not zero), you must file a PA-40 tax return by the April due date. If you had taxable income for another state (Box 16 on Form W-2 is not zero and Box 15 is other than PA), you may also need to file a return for that state. Please refer to this guide when filling out your state and local income taxes. You can also check with that state’s tax department for guidance. If you had taxable income for the City of Bethlehem (Box 20 on Form W-2 is BETHLEHEM and Box 18 is not zero), you must file a Keystone local tax return by the April due date. Do not submit Form 1042-S with your Keystone tax return. If you had taxable income for another locality (Box 18 is not zero and Box 20 is other than BETHLEHEM), you may also need to file a return for that locality. Check with the tax offices in that locality for more information.